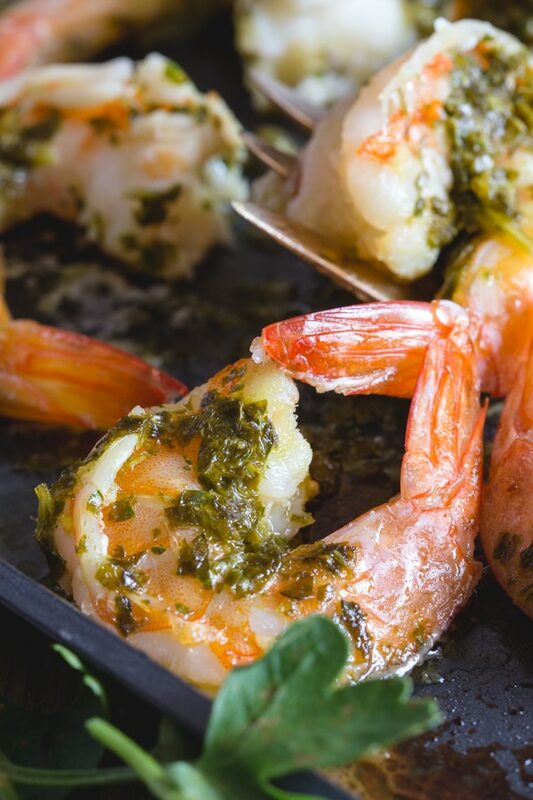 Baked Shrimp never tasted so good! 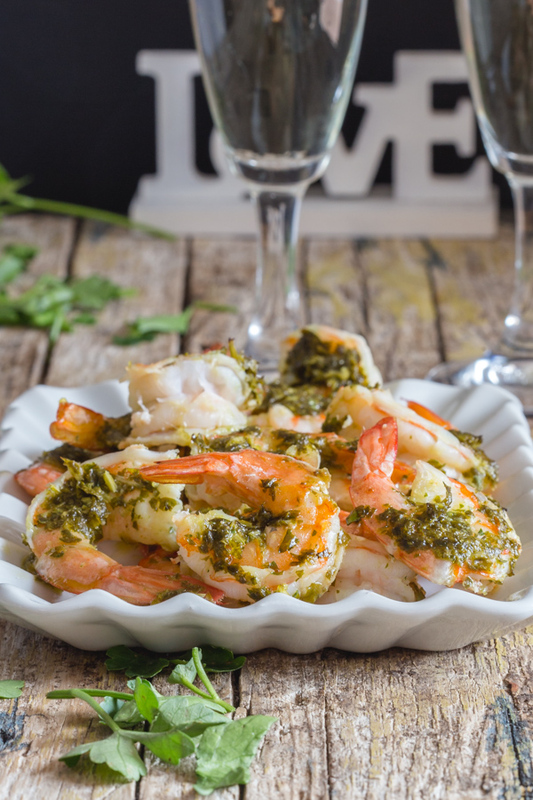 Shrimp drizzled with a simple parsley and olive oil sauce then baked and served. A delicious quick and easy Dinner idea. THIS MONTH FOR MY LITTLE GET TOGETHER WITH MY FOUR BLOGGER FRIENDS, WE DECIDED TO SHARE A COMPLETE VALENTINE’S DINNER MENU! I decided to share something that I have grown to love to eat while being in Italy. And that is Shrimp. I always get called out on just calling them shrimp because in English there are so many names for these crustaceans. But Italians like to refer to them as Gamberi, gamberetti or gamberoni, in other words, small, medium, and large works for me. For this recipe I used gamberoni. I tossed them with a simple parsley and olive oil sauce and baked them for about 8-10 minutes. The perfect fast and easy dish for Seafood lovers. How long to cook shrimp? Be sure to cook the shrimp only until pink for approximately 8-10 minutes. To know when shrimp is cooked follow these tips, when the shrimp are straight they are undercooked. C-shape curled shrimp are perfectly cooked and shrimp that have formed into an O-shape are overcooked and rubbery and not very appetizing. I don’t know about you but in Italy you can’t buy cleaned shrimp (gamberoni) ready for cooking so you will have to clean them yourself. Here’s a great guide on how to Clean Shrimp. 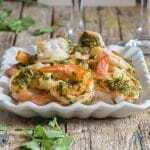 So whether you celebrate Valentine’s Day or not I think this Baked Shrimp is a fast and easy Dinner idea anytime. Buon Appetito! 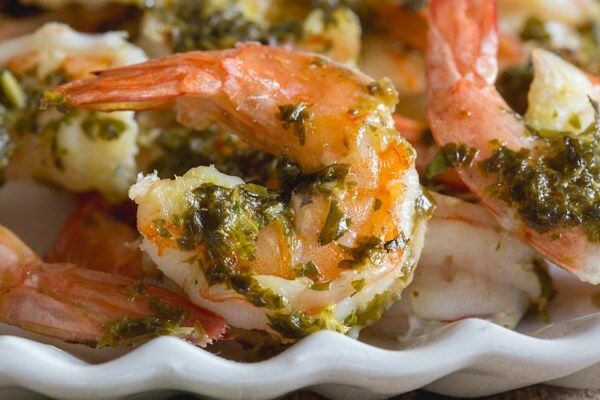 Baked Shrimp never tasted so good! Drizzled with a simple parsley & olive oil sauce then baked and served. 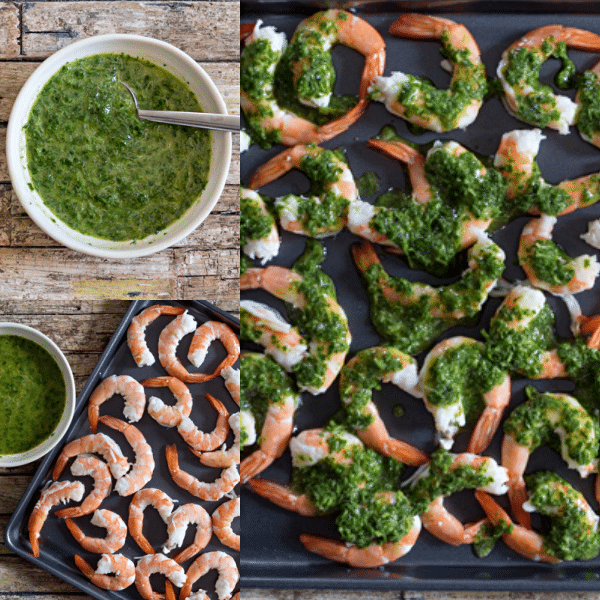 A quick & easy Shrimp Dinner idea. Clean and devein shrimp, set aside. In a blender or food processor add the lemon juice, olive oil, parsley, salt and pepper and blend until ingredients are well mixed and parsley is finely chopped. 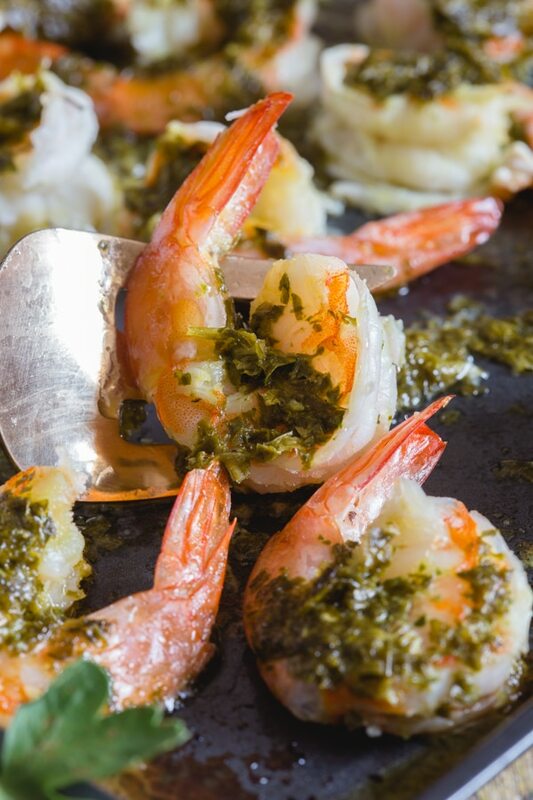 Place the shrimp single layer on a cookie sheet, drizzle with sauce and cover with parchment paper (keeps the shrimp from drying) and bake for approximately 8-10 minutes or shrimp are cooked. Serve immediately, Enjoy! 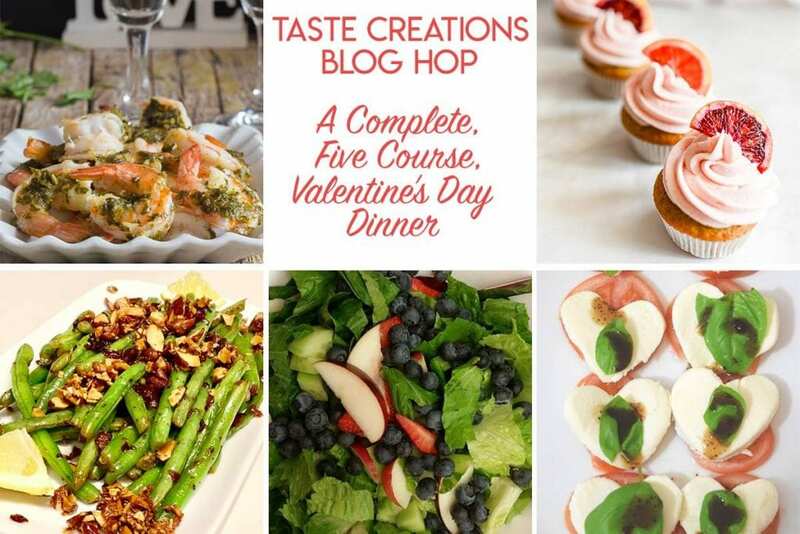 THE TASTE CREATIONS BLOG HOP HAPPENS ON THE 1ST MONDAY OF EVERY MONTH. EVERY MONTH, MYSELF AND 4 OTHER BLOGGERS CHALLENGE OURSELVES TO MAKE SOMETHING WITH A CHOSEN INGREDIENT. HOPE YOU WILL CHECK OUT THEIR DELICIOUS RECIPES TOO. AND HAVE A GREAT WEEK EVERYONE! Your shrimp dish looks wonderful! I love the shrimp tips you included with your recipe. Thanks Lauren, I hope you enjoy! I cannot imagine cleaning shrimp. Nope. But Bob would do it, so that’s ok. It’s probably not as bad as I am imagining it!